Can you really charge your new iPhone 6 with a microwave oven? Do oblivious texters deserve their own lanes on the sidewalk? And why are hackers downloading video games to your wireless printer? Get answers to these burning questions, and the scoop on the latest tech news, in this edition of the Geekly Update. It's guaranteed to make you 146% smarter. Read, think and comment! Last year, the evil jokers on 4Chan tried to convince everyone that the new iOS 7 made their iPhones waterproof; a few people actually took the challenge and drowned their pricey toys. 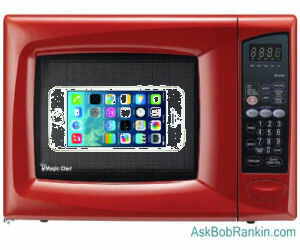 Now the 4Chan gang wishes to inform you that iOS 8 supports recharging of iPhones by zapping them in a microwave oven. Please, do not do this (unless you can send me pics). The locations of future crime waves can be predicted with up to 68% accuracy using cell phone carriers’ records of customers’ demographics and movements, according to UK researchers. This is good for planning police patrols. The scary part is how easily and inexpensively the researchers were able to obtain phone owners’ ages, genders, and locations. Data encryption will be enabled by default in the next generation of Android, due in October. Android has included encryption for three years, but now users won’t have to remember to turn it on. Unfortunately, your cellular carrier is probably years behind in updating Android on your phone. “A History of Misses For RadioShack” is an interesting reprise of the iconic brand that totally missed not only the high-tech industry’s boat but its entire navy. Apparently, RadioShack once owned things called Energy Express, Famous Brand Electronics, McDuff, Video Concepts and the Incredible Universe. Who knew? “I am tired of seeing real criminals with lots of victims being ignored, while traditional law enforcement is busy going after perpetrators of victimless crimes such as those involved in the Silk Road Marketplace,” says Roger Ver, co-creator of Bitcoin. The man known as “Bitcoin Jesus” has launched the site Bitcoin Bounty Hunter which pays for information that leads to the convictions of hackers and identity thieves. If you don’t mind being paid in Bitcoins. "A slam dunk?" Canon Pixma wireless printers have virtually no protection against WiFi-armed hackers, according to Michael Jordon of the UK IT services firm, Context. He was able to make a Pixma printer download and install on itself a “firmware upgrade” that was really a copy of the “Doom” video game. Larry Ellison, the colorful cofounder of database giant Oracle Corp., has relinquished the company’s CEO seat. There will now be two co-CEOs who are named – wait for it – Mark Hurd and Safra Catz. I wonder when the “herdin’ cats” jokes will die down. Ellison will remain executive chairman of the board. Patent trolls are trembling fearfully in the aftermath of the U.S. Supreme Court’s August 26 ruling in Alice v. CLS Bank. The Court effectively ruled that taking routine human activities – such as holding money in escrow until a transaction is complete – and doing them in software does not create a patentable new invention. So far, at least 11 dubious patents – including one on the game, “Bingo” – have been challenged by defendants citing the Alice ruling; in every case, the patent was invalidated. Artist Adam Ben-Dror created a mobile fish tank that is controlled and steered by the movements of his pet Siamese fighting fish, Jose’. A camera records Jose’s swimming movements and software translates them into instructions for the “Abovemarine” car’s four omni-directional, electrically-driven wheels. Brakes are applied when Jose’ swims backwards. Now that's patent-worthy! Leave a pithy comment below, or I'll decrypt your smartphone with invisible laser beams. Most recent comments on "Geekly Update - 24 September 2014"
You need to get help with that lisp. No pithy comment.....BUT....have you seen this one, Bob? The Radio Shack History article missed a few items. During the 70's, Radio Shack's parent company Tandy Corporation bought Color Tile in order to have access to cheap flooring for all of the Radio Shack stores that were being built. They had Computer City stores that were sold to CompUSA in the early 90's and I know that they owned O'Sullivan Industries for about 10 years. Regarding Radio Shack, I had 2 Radio Shack computers with TRSDOS operating systems. The first was the Model 111 with 48 k of RAM and the second was the Model IV with a screaming 64 k of RAM! I thought Radio Shack computers would be a continuing force, but today, most people have not even heard of them. Great info gotta love 4chan. Just tried dictation.io. Interesting, but no match for Dragon Systems with an external mic. Oh, how I wish, I could say that, 4Chan realizes the "intelligence" of iPhone users everywhere ... But, that would be a bold-face lie. The reality is ... This is the "intelligence" of way too many Smartphone users, be they Android or iPhone users!!! I had friends, who bought and used Tandy Computers, way back when. This was during the time, that many companies were trying to get on the "bandwagon" of personal computers. So many tried and so many lost!!! I also, remember when CompUSA was a retail store, where you could almost guarantee that, you would find what you needed, for your computer, be it parts or software. Now, CompUSA is part of Tiger Direct and mainly, an online store, for computers, electronics and the like. They may have gone the way, that Newegg has ... Trying, to sell all goods, to beat Amazon. Better still, let's have electronic fields that use up their minutes whenever they are "sensed" to be walking and texting outside of assigned locations. Maybe,10x the actual usage. (This might also work for the unlimited data owners because their providers are sure to find a way to up the plan(s) cost.